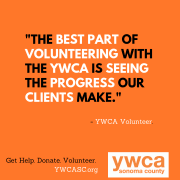 Purpose: One of the key values of the YWCA of Sonoma County is community. We consider our community our greatest asset, and are always looking to leverage the special talents and skills of our fellow SOCO residents with our resources to achieve our mission: ending domestic violence. A VIP Volunteer is a community member who uses those gifts to assist the YWCA with special projects. Requirements will vary by project. General requirements are below. This volunteer opportunity is on an as-needed basis. We will reach out to you when special projects are needed. Benefits: The opportunity to promote the mission of the YWCA and positively impact your community. The real benefit comes in knowing the work you do each day changes the lives of our clients through a philosophy of support and self-empowerment.